Whitehall, thought to have been built circa 1855 by John Marshall, began as a modest two-story brick house in the Italianate style popular during the mid-19th century. Guided tours of Whitehall House & Gardens are offered to the public Monday through Friday, 10 a.m. - 2 p.m. Admission is $5/adult; $4/seniors 60 and over; $3/student; and free for children 5 and under. A special rate of $3/adult is offered for groups of 10 or more visitors. The first floor of Whitehall is handicapped accessible, and the parking lot accommodates 75 cars. Reservations are highly recommended. For more information or to schedule a tour, please call Whitehall at (502) 897-2944. Thought to have been built circa 1855 by John Marshall, began as a modest two-story brick house in the Italianate style popular during the mid-19th century. It sat on twenty acres of land that had been part of the original Spring Station tract owned by Samuel and Norborne Beall, and Bealls Branch, a tributary of Beargrass Creek, ran through the property. Ownership of the house passed through five different people until it was purchased in 1909 by successful horseman and entrepreneur John Middleton. Renovations to the home made under the supervision of Mrs. Middleton fashioned the Southern-style Greek Revival mansion we know today as Whitehall House & Gardens. In 1924 Whitehall was purchased by Hume Logan, president of the Logan Company, a fence and steel products manufacturer. Hume Logan, Jr., the middle son of Mr. Logan's five children, purchased the home shortly after the death of his father in 1948, and lived in Whitehall as a bachelor until his death in 1992 at age 94. 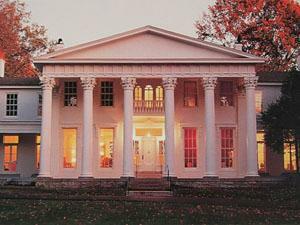 The house, gardens and many of the unique furnishings were bequeathed by Mr. Logan to the Historic Homes Foundation so that the public would always be welcome to enjoy this special home. Whitehall was extensively refurbished in 1994 under the expertise of local design firm Bittners as that year's Junior League of Louisville Historic Showhouse.